UK organisation BRE and the University of Chile sign agreement to promote innovation and sustainability in Chilean construction sector. Dr. Peter Bonfield, CEO of the BRE Group, and Patricio Aceituno. Dean of the Mathematics and Physical Sciences Faculty at the University of Chile sign MOU. 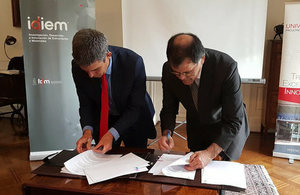 The UK Organisation Building Research Establishment (BRE) and The Centre for Research, Development and Innovation of Structures and Materials (IDIEM) from the University of Chile signed last week a Memorandum of Understanding (MOU) related to sustainable construction in a ceremony held at the British Residence. Dr. Peter Bonfield, CEO of the BRE Group, Patricio Aceituno Dean of the Mathematics and Physical Sciences Faculty at the University of Chile and Fernando Yañez, Director of the IDIEM Centre participated in the MOU signing ceremony that celebrated the future work of the two “like-minded” UK and Chilean institutions. As part of the MOU, both BRE and IDIEM will collaborate on sharing knowledge and capacities in all aspects of sustainable built environments to develop best practices and standards within the Chilean construction industry. BRE brings considerable experience in the field of promoting innovation and sustainability to the Chilean construction sector and associated industries. From 2013-2014, the British Embassy Santiago’s prosperity fund project ‘Code for Sustainable Homes in Chile’ implemented by BRE developed the standards and references for Chile’s first sustainable construction code for dwellings together with the Chilean Ministry of Housing.